Thank you, Alpha Gamma Rho fraternity, for all the time, hard work, and effort put into making a hugely successful fundraiser for Michigan AgrAbility! 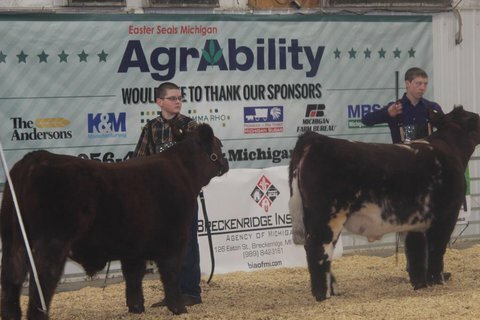 AGR's "MSU AGR Beef Preview Show" had a record number of head entered (224 market prospects and 155 breeding heifers) and with the help from everyone that entered cattle and all of the show's sponsors, AGR was able to raise $9,500 for Michigan AgrAbility. Meet Jose Garza! Jose has trigger finger in his right hand, making it impossible to prune orchard trees. Michigan AgrAbility, working with Jose, his wife, and his employer, identified assistive technology to enable Jose to keep working all year. With the help of contributions from Easter Seals and Telamon Corporation of Sparta, Jose and his wife could pay the balance of the cost of a new power pruner! The new power pruner and the additional assistive technology (plus stretching exercises) enables Jose to apply his knowledge and skill to the farm operation year-round. Michigan AgrAbility extends a heartfelt thank you to Jeff VanderWerff, Jose's employer, Jose's family, Easter Seals, and Telamon Corporation, for funding assistance. Thanks also to Dave Chase, owner, Peach Ridge Orchard Supply. Read more about Jose and how Michigan AgrAbility's services assisted his family on our website: Michigan AgrAbility.